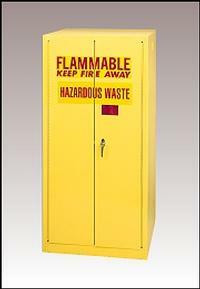 Safely contain a 55 gallon drum of flammable liquids or hazardous waste in the E-HAZ2610 vertical drum storage cabinet. The cabinet features self-closing doors, a convenient half shelf for additional storage space for accessories or containers and drum rollers for easy drum handling. Optional model E-1957 (Pic. 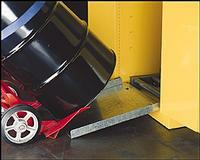 2) drum cabinet ramp makes loading and unloading much easier.